When your body is under stress, it releases stress hormones like cortisol and adrenaline. And these hormones, when released into your body on a regular basis, can begin to increase fat storage in your midsection. You need to be on the lookout for stress overload, or the point at which stress can become both mentally and physically damaging. 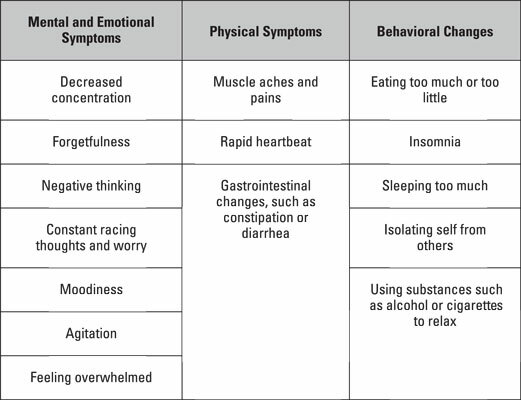 The figure shows some common symptoms caused by stress overload. The more symptoms you display, the closer you may be to experiencing stress overload. Learning strategies to reduce and manage stress is important for preventing negative health effects. Managing your stress is all about taking charge. If you start to take control of your emotions as well as your environment, schedules, and any other factors that may bring on stress, you can start to manage stress in a healthy way. Also, make time every day to relax, rest, and unwind from the stressors of the day. Even if the stress in your life seems out of control, you can control the way you respond to it, which can make all the difference. With practice, you’ll be able to better identify stressors in your life, be able to better handle them, and be able to better control the situation causing them. Doing so gives you more confidence that you can face these stressors and challenges, which in itself can help to reduce the overall stress you feel inside. As your levels of stress and anxiety decrease, the stress hormones your body releases also start to decline, helping you to shed excess weight around the middle.